Incorporating the ATA-133 interface, the Samsung SP1203N internal hard drive renders a better performance. With a spindle speed of 7,200 RPM, this Samsung internal hard drive delivers excellent speed for efficient transfer of data and performance of other tasks. Get data from any device or program faster with this Samsung hard drive that has an average seek time of 8.9 ms. Incorporating a 2 MB cache, this Samsung internal hard drive provides the data stored in them faster, in case of future requests. 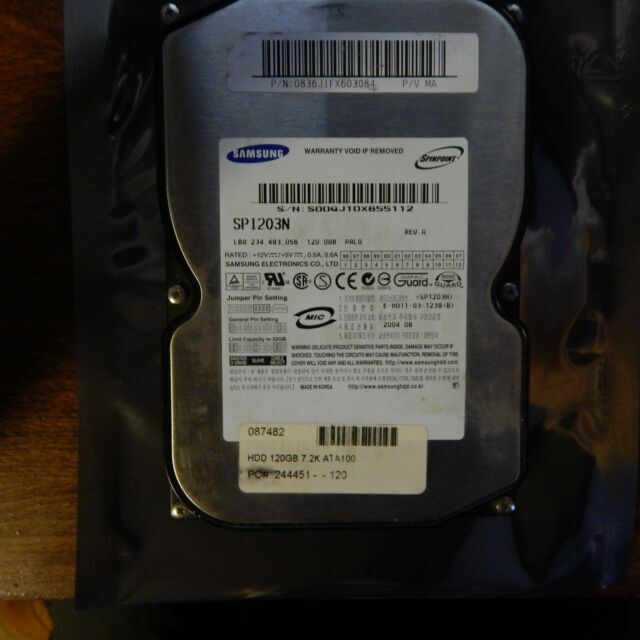 Read and write data at a greater speed due to the 92.6 MBps internal data transfer rate of this Samsung hard drive. With an average latency of 4.17 ms, the Samsung SP1203N internal hard drive transfers packet data from one point to the other without delays. good drive, I would recommend it without hesitation. When my wife's computer hard drive crashed, she was broken-hearted because there were a lot of pictures and very important files she wanted back. I had no option but to buy a new drive just like the old one, take both drives apart, and replace the broken part with the new one. I was able to recover all of the files from the old drive, put the part back in the new drive and get the computer up and running again, needless to say, putting a smile on my wife's face. I still don't know why the drive crashed in the first place, but I suspect my two-year old...he apparently hada fascination with the start up botton on the face of the computer which is no longer accesible to him, needless to say! Very good drive for the money. No problems installing, partitioning or formatting the drive. I wouldn't hesitate to recommend this drive to a friend.